Rita Ora was up nice and early to promote her new song, ‘Only Want You,’ on NBCs The Today Show on Monday (March 25). My first reaction to this Miu Miu cut-out detail floral dress from the Spring 2019 collection was that it felt a bit too twee for Rita. This is the girl who goes hard and edgy when it comes to her looks, so I was taken by surprise with this. But on reflection, I feel the twee-ness is more due to the styling with the bow ribbon accented her hair and the cutesy red Miu Miu Mary Jane pumps. For her next appointment during the promotion of her new single, Rita was spotted in Soho looking gorgeous in Michael Kors Collection Pre-Fall 2019. Now we all know that Rita loves shearling coat, but I feel this one will be more palatable for you, as it pays a beautiful homage to the ’60s in a super cool way. This was amped up by the gold shades, with the rest of her look taking on more of a laid-back vibe with a Wolford bodysuit and ladylike floral skirt completing her look. Methinks you’ll love this one. I do. For her final appointment of the day, Rita out did herself rocking her most colourful look yet. 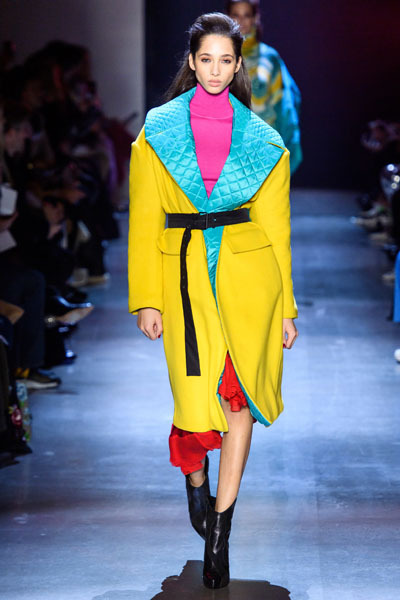 I mean, what’s not to love about this Prabal Gurung ‘Kalak’ oversized quilted collar wool coat? I want snuggle up in bed with it, never mind hitting the streets of Tribeca. If this was anyone else, perhaps the coat would’ve been the stand-out piece. But we all know Rita doesn’t do things by halves, so she kept the runway turtleneck and rocked a pair of orange boots. I just wish that barely seen orange asymmetrical ruffled skirt had a moment too.